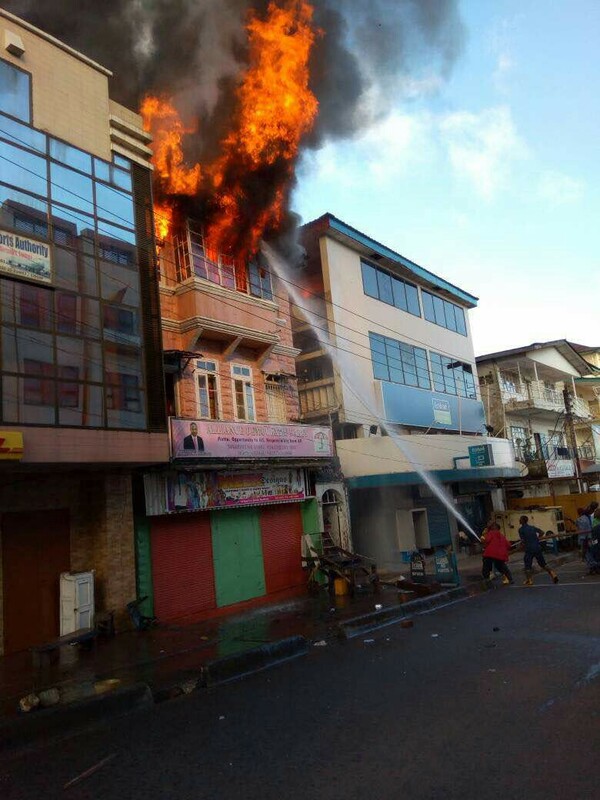 After a week of frenzied and bitter struggle for power in the opposition Alliance Democratic Party (ADP), the party’s office in Freetown has this morning become a towering inferno, as a handful of firemen battle to save the building. No one is thought to have been in the building which is located at Rawdon Street when the fire started. Journalist – Emmanuel Kamara said that the leader and chairman of ADP who doubles as the presidential candidate for the 2018 elections, Mohamed Kamaraimba Mansaray has just confirmed the news. Mr. Mansaray told Emmanuel that two people were seen near the building with a bottle, which was then thrown into the building to cause the fire. He said that the two suspects ran away. Kamaraimba alleged that thugs were sent to burn down his office. But sceptics say that the fire may have been caused by someone, so as to destroy official records that are being requested by the country’s Political Parties Registration Commission (PPRC) for investigation into the party’s affairs. The Sierra Leone Telegraph will be conducting an interview with Mr Kamaraimba about this and other recent developments in the party. What is the deal with this guy? Why is there so much animosity towards him? If I can recall, there was an incident about a year ago where protesters besieged his office and supposedly there was a shooting involved. Why are people taking such extreme measures to rid this man out of Sierra Leone’s political radar?